Product #20806 | SKU SC4063-BM | 0.0 (no ratings yet) Thanks for your rating! 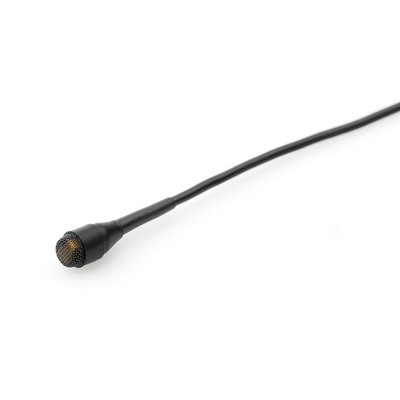 The DPA 4063 is a miniature omnidirectional lavalier microphone designed for use in performance and theatrical applications. The miniature lavalier features a condenser element with a frequency and sensitivity response that will accurately reproduce audio signals from the human voice and instruments. The capsule is designed with a double-vent protection system and moisture-resistant materials inside the capsule, which ensure maximum protection from humidity and moisture caused by perspiration, makeup, etc. The 4063 includes interchangeable capsule protection grids that alter the signal character of the microphone. A "High Boost" capsule creates a peak at 12kHz, creating an airy texture to audio signal. The "Soft Boost" capsule creates a subtle boost between 8-20kHz, enhancing signal presence. With a SPL rating of 138dB, the microphone is more than capable of reproducing transient (peaking) audio before clipping. The 4063 is powered via +48V phantom power and features a MicroDot output connector, compatible with various wireless microphone transmitters or power supplies with standard XLR outputs. Note: *All DPA microphones feature a proprietary MicroDot connection and may require an optional adapter for use with various wireless microphone transmitters. Identical to the DPA 4060, the 4063's low DC is designed to match systems delivering down to 3V power. Sensitivity is adjusted to 6mV/Pa to match some of the more sensitive transmitters on the market. The 4063 features a double-vent protection grid and moisture-resistant materials which prevent damage from humidity, perspiration and makeup. If powered correctly the microphone will be able to handle sound pressure levels up to 138dB SPL before clipping occurs.